Julian Assange Rushes To Defend Homocon Milo - Joe.My.God. 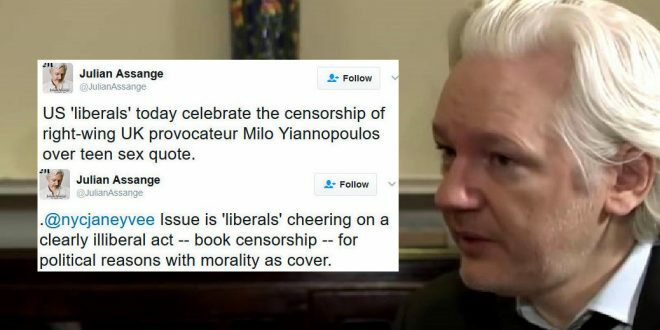 WikiLeaks founder Julian Assange decided to get in on Milo Yiannopoulos‘ most recent controversy by denouncing the “liberals” who are happy that the Breitbart tech editor has been exiled from the Conservative Political Action Conference (CPAC). Yiannopoulos was meant to give a speech at CPAC this week, but after a video surfaced of him apparently defending pedophilia, he was disinvited from the event. Yiannopoulos has stated that he is “horrified” by pedophilia, but the impact of the video cost him his book deal with publisher Simon & Schuster, and there are indications that Breitbart might be thinking about firing him.
.@nycjaneyvee Issue is ‘liberals’ cheering on a clearly illiberal act — book censorship — for political reasons with morality as cover.